Many of you know our good friend, Matt Thomas, and that tragic injury he suffered. On July 9th, 2009 Matt was mountain biking with some friends when he was severely injured. He dislocated his C6 vertebrae. The resulting life changing spinal cord injury has left Matt a quadriplegic with no feeling or use of anything below his chest and limited use of his arms. Amazingly, Matt has remained positive and optimistic, which has been an inspiration to those who know him. For the last several months Matt has been attending a cutting edge SCI rehab center in Carlsbad, CA called Project Walk. 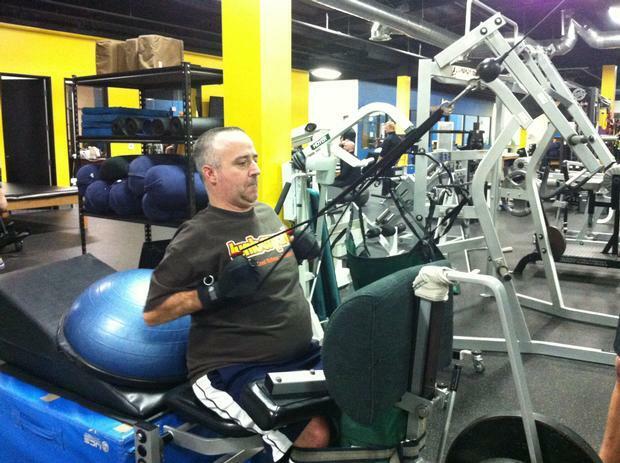 Recently he switched to attending a similar facility (www.vipneurorehab.com but with additional equipment. VIP Neuro Rehab has a Lokomat, Mattâ€™s favorite piece of equipment, which is a robotic device that allows him to walk on a treadmill. There are only a few of these in the country and he is very fortunate to have access to one. He has made steady gains daily in strength and mobility, and continues to see daily progress. Every little improvement is a huge benefit to him physically and mentally! It is a slow tedious process and the name of the game is commitment and perseverance to run a good race. Believe us when we say that Matt has more than his fair share of both! The plan moving forward is to continue attending VIP Neuro Rehab and take advantage of the cutting edge equipment and treatment. However, to stay on his path to recovery he needs your support! Many of you have been supporting Matt in his journey to recovery and he is forever grateful for your support! If you havenâ€™t supported him yet and are inspired by his story then consider supporting him now. If you are currently supporting himâ€¦THANK YOU!!! The best way to support him is to sign up on this page to give a small amount each month. For just $20 a month you can personally help Matt achieve his goal of walking again! THANK YOU FOR SUPPORT! LOVE YOU! Keep on grinding Matt! Sending some positive vibes your way. Here's to you getting your feet back under you. MATT, YOU LOOK GREAT DOING PUSH-UPS. WHATS IN THE SILVER BOTTLE NEST TO THE MAT. tHE VIEW OF THE GYM SHOWS EXTENSIVE EQUIPMENT FOR REHAB. ETNA IS COLD THIS MORNING BUT WE EXPECT TEMPERATURES IN THE LOW 50S DURING THE DAY FOR ABOUT A WEEK. WE WERE HAPPY TO HAVE YOUR DAD AND MOM HERE FOR OUR MONTHLY CARD PARTY. tHEY KEEP US POSTED REGARDING YOUR PROGRESS WHICH IS AMAZING. NOT MUCH CHANGE EACH DAY BUT GREAT CHANGES IN WHAT YOU CAN DO EVERY UPDATE WE GET FROM YOUR MOM AND DAD. WE PRAY FOR YOU DAILY. tHE LORD TAKES HIS TIME TO ANSWER PRAYERS BUT THEY ARE ALWAYS ANSWERED. LOVE YOU AND MISS YOUR CHEER. Your story is amazing and you inspire even those of us who don't personally know you. Hope you are well on your way to 300 monthly contributors!